Vaping or using e-cigarettes is a fairly new trend. However, it’s important to know that it is not harmless. 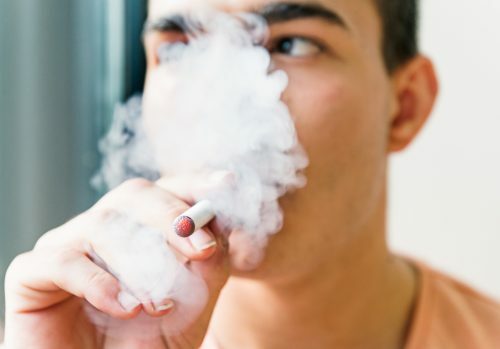 In fact, as of 2016, retailers cannot sell tobacco products including electronic smoking devices like e-cigarettes, to anyone under 21 years of age. To help your child avoid vaping, talk to them about the dangers associated with e-cigarettes. The chemicals found in vaping products are harmful to the body and the Nicotine can make it hard for them to quit. Ingredients used in anti-freeze have been found in vaping products, as well as aerosol, formaldehyde, and other cancer-causing agents (American Lung Association). These chemicals found in the e-liquids, are needed for e-cigarettes and vape pens. “To create an e-liquid, nicotine is extracted from tobacco and mixed with a base, and may also include flavorings, colorings and other chemicals” (American Lung Association). E-liquid flavors can include tempting options such as, mint, cotton candy, apple pie, or gummy bear. However, no matter how tasty these flavors might sound, they are harmful and bad for your health. For more information on the dangers of Vape pens/E-cigarettes, please click here. For more information on talking to your child about vaping and e-cigarettes, please click here.